DanceEast Rural Retreat 2012 group photograph. © Eamonn McCabe. I went to the final get-together of of the Rural Retreat on Monday at the House of Commons. I’ve been to a few of these wrap-up sessions now and they are good for the soul – all the participants are high as kites from sorting out how dance can go forward, filled with amazing ideas from the inspiring speakers they have heard and their own brain-storming. If they achieve half of what they hope the dance world will be transformed! Although common in business this type of dance event/training is unique in the world and it’s a wonderful thing DanceEast do. This cohort’s big message is that “It’s all about DANCE, stupid”. And it’s a good message – why reinforce divisions when you can promote a much more diverse view that encourages all to look more widely. It’s never easy to fund and do great art but at get-togethers like this you feel an extra notch or three of artistic goodness being injected into the global dance diaspora and I wish them all well for the future that will wow us. And have to include a short word of appreciation re the House of Commons – a wonderful location but even more memorable I think for how courteous and helpful all the staff are in getting you in and sorted. A great credit to all. 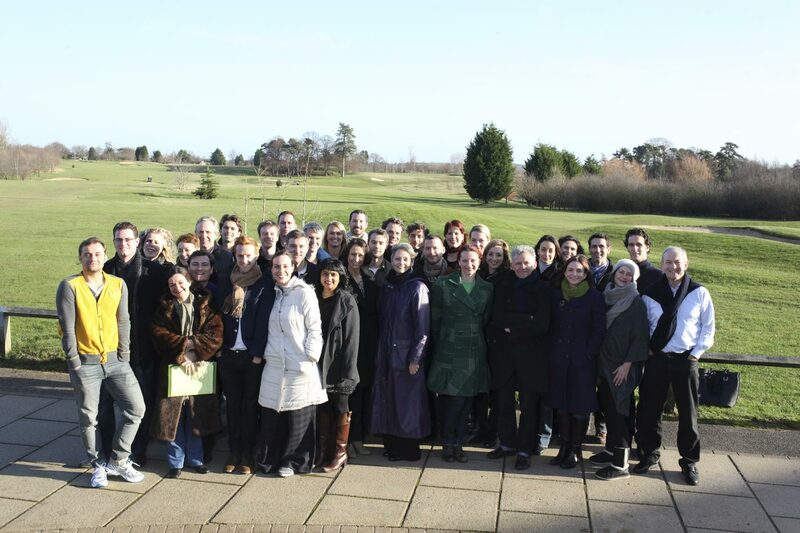 26 emerging and future dance leaders representing 13 nationalities, chosen for their potential to inspire and move forward leadership of dance companies met in Suffolk this weekend, 6 – 8 January 2012, and called for dance to be re-branded to break away from dance form fragmentation. The Rural Retreats, produced by DanceEast, focused on the challenges faced and skills-set needed by Artistic Directors in dance, and tackle the major problem of the lack of training and formal professional development for Artistic Directors. Guest speakers who are leading figures in advertising, sport and the arts shared their experiences, including Sir John Hegarty, Worldwide Creative Director and Founder of advertising agency, Bartle Bogle Hegarty, Daniel Topolski, writer, broadcaster and former Olympic rowing coach, Alistair Spalding, Chief Executive and Artistic Director of Sadler’s Wells; David McAllister AM, Artistic Director of Australian Ballet; Carrie Cracknell, co-Artistic Director of the Gate and Kathleen Soriano, Director of Exhibitions, Royal Academy of Arts. Inspired by Sir John Hegarty who talked about his experience leading world famous advertising campaigns including the Levi’s commercial starring Nick Kamen, and for introducing the phrase ‘Vorsprung Durch Technik” for Audi to the British public – the group of future leaders agreed collectively that dance needs to re-brand under one umbrella, “Brand Dance”, to inspire and communicate dance as an inclusive, relevant and accessible art form – tackling its elitist image. The weekend ended with a heated debate which asked the delegates to vote on whether dance leaders are born or made. The group was split, but the final vote went in favour of leaders being “made”. Assis Carreiro, Artistic Director and Chief Executive of DanceEast says: ‘I was overwhelmed by the passion, rigour and huge intelligence shared by all 26 participants who came together this weekend. It was an intensive time of deep thinking, inspirational guest speakers and a very unique opportunity to come together to share so much in a very nurturing environment filled with camaraderie, non stop discussion and commitment to dance. I am so proud to be producing an initiative that is very needed by the art form. DanceEast Rural Retreat 2012 group photograph. © Eamonn McCabe. Click image for larger version, or one that fills the browser window. Robert Parker (UK) – Birmingham Royal Ballet Principal and new Artistic Director of Elmhurst School for Dance. Since 2003 DanceEast’s Retreats have brought guest speakers from the worlds of business, sport and the arts to interface with existing and future dance leaders. Previous guest speakers have included ex-England Football Manager Graham Taylor, Random House’s Gail Rebuck, and David Lan (Young Vic) and Nick Hytner (Royal National Theatre). DanceEast’s Rural Retreat 2012 is made possible through the support of the Jerwood Charitable Foundation, Tezmae Trust, Best Western Ufford Park Hotel, Golf and Spa, Harlequin Floors and Arts Council England.